Yes, gin is trending and has been for a while. Shelves are filled with bottles of crystal-clear and water-white gin; but then there are a very few that have another hue. Four Pillars Sherry Cask Gin stands out! Four Pillars distillery in Australia is all about gin. They have a selection of gins and two of them have enticing amber colour along with rather tasteful yet plain and simple bottles. Think old-fashioned apothecaries’ bottles. These days, gin isn’t usually stored for long. In the old days, gin was often put in barrels for transportation, but it was kept only until the contents of the barrel were consumed. Gin was often sweetened, but only to remove some of its harsh qualities. Old Tom gin had just that sweet profile, and the name is rumoured to have come from its illicit dispensing via the medium of a wall-mounted gin-spitting cat. Well, it’s a great story anyway, although this style of gin fell from favour and dry gin has become more popular. 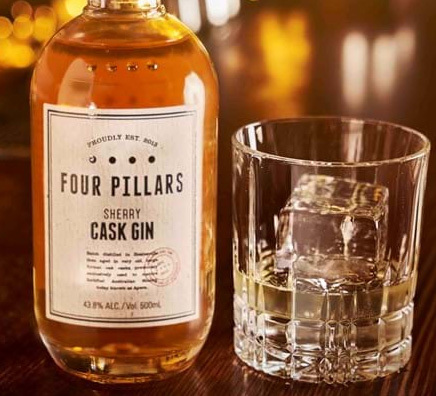 Four Pillars Gin started ageing one of their first batches of Rare Dry spirit in old Chardonnay barrels at the end of 2013, and now have three barrel-aged gins. Sherry Cask Gin (Sherry and Apera – Australian sherry – casks) is a striking gin and definitely one for the more serious sipper. It’s for those who taste and savour. This gin is produced via the solera system. It’s the same method as used in the production of fine Balsamic vinegar, along with some quality ports and sherries. The sherry cask solera is made up of 42 ex-sherry barrels with ages ranging from 15 to 35 years. These barrels were first filled with gin more than a year ago, and this is the first solera release taken only from the bottom row of barrels. The barrels are never emptied: a small quantity from each barrel is taken out, which is then replenished from the row above. Fresh gin is only ever put into the top row of barrels. Thus the slowly-aging gin cascades down through the rows of barrels. The desirable Sherry character adds unique depth and complexity. A well-crafted and characterful gin. Best enjoyed with a simple tonic.